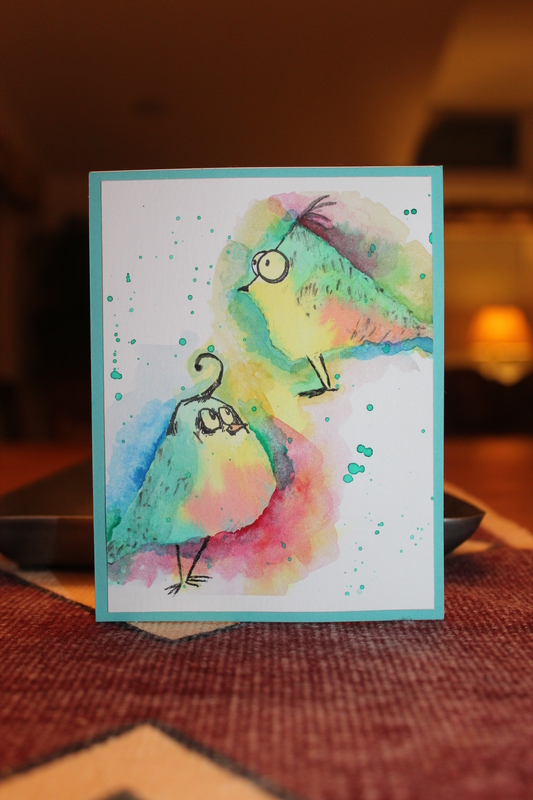 The Online Card Class-Intermediate Watercolour is so amazing. Any ONE day of the class is worth the price of admission to the whole class. I am quite far behind in trying out many of the techniques, but I want to try them all. Today I tried out the concept of negative painting. For the first attempt I used the Crazy Birds…………………I figured they were crazy anyway so what further damage could I do. 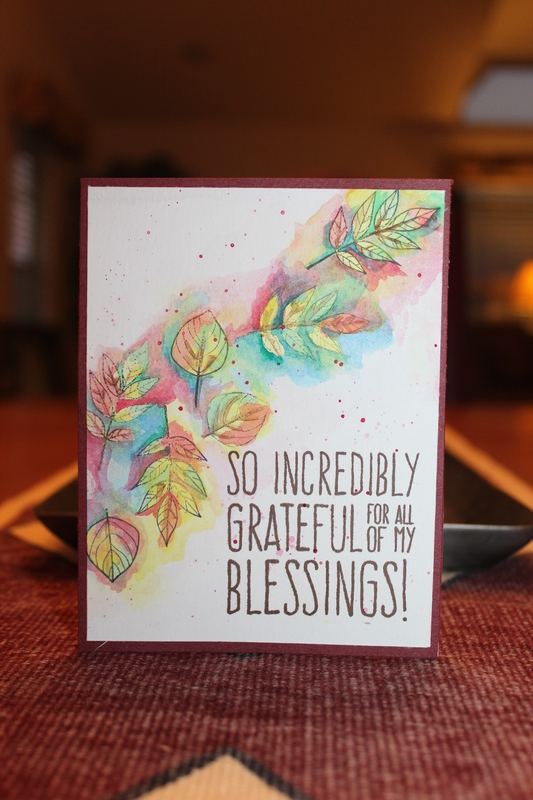 For my second try I used a stamp set from the Simon Says Stamp November Card Kit. I think it turned out rather well. As luck would have it, or as a result of poor or no planning, I decided to go to Mexico just when this class started. Now it is winding down and I am just getting started on it. For some reason while I was attempting to make something that was even remotely worthy of being posted in the gallery, I was reminded of a quote from Dolly Parton. She said something like, “it takes a lot of time and effort to look this cheap!” That is kind of what I think about watercolour. You are trying to make something look like it flows and is kind of slap it down random and it just is not easy. I have quite a pile of watercolour card front discards to prove it isn’t easy. The first card I made is too…………everything……….. to even post. The second is an attempt at making a variegated wash. It is so so. The third was an attempt at making a freehand painted rose. I have done several cards with watercoloured roses started with a stamp, but it is much more difficult freehand. Several attempts went in the garbage. While the one posted here isn’t great, it is a vast improvement over my first attempt. The challenge this week at Papertrey Ink is to make a matchbox something or other. I decided to make a rather large matchbox and to make my own candy bag to put in it utilizing my under utilized fuse tool. Once again I am agonizing over supplies that I did not bring with me to my winter home here in Phoenix, and questioning my sanity over things I did bring, like dies without the matching stamp set! What is up with that? Oh well, in spite of my rather odd supply choices, I managed to make something. I’m a little Viking Short and Stout! Wait a minute, I think that is supposed to be a teapot short and stout but you get the idea. This little stamp set from Avery Elle was one that immediately went in my cart , the moment it was available. There was just something about that rascally looking Viking that appealed to me. Today was the first day that I had a moment to make something with it. I think it turned out rather well and will make a great Valentine’s Day card for one of my grandchildren. The theme this week at the Wednesday Challenge for Simon Says Stamp is Critters. The company being featured is Lawn Fawn and they invited us to include a picture of our real critters. Normally, I have nothing to offer, but right now I DO have two furry roommates…….that have wormed their way into my heart. Now my real critter picture of my furry roommate, who just “wheelie” likes to take the WHEEL of our golf cart. Yesterday was scrapbook day here at the park, so I had to see if I could break out of my slump and actually make something. Usually, a brand new stamp set will get me going. I such a stamp set from Papertrey Ink. Of course, I packed pretty much all the wrong supplies for the class. This is another reason why the Scrapbook class right here in the park is such fun. I just took five minutes to go home and get the items I was missing, like my Misti and Memento black ink. and then was back at work on the card. I like how the card turned out. I think it is a Valentine’s card even though it has no hearts, no red or pink or any arrows or cupids. Supplies: Papertrey Ink Doodlie-Do stamp set, Copic markers, Memento Ink, Hero Arts card base and Scor tape. I am having trouble diving back in to scrapbooking and cardmaking after the Christmas and wedding and driving to Phoenix hiatus. It sure isn’t that I have lost interest…….I have just lost my mojo. I went shopping at three different stores today and came back with next to nothing. I had to buy some mats for my cutter because I forgot to bring them from home and I had to buy some staples for my Tiny Attacher, but not much else jumped out at me. I thought I would jump start my mojo, by just selecting a challenge from my usual stamp companies and get after it. Each challenge I looked at seemed to have a reason why I couldn’t complete it. Either the medium that would be perfect for it was one that I didn’t bring with me to Arizona or the stamp I wanted to use was also still back home. I couldn’t justify buying something here when I already own it at home, so on to the next challenge. Enough whining already, I settled on the Wednesday Challenge from Simon Says Stamp. They are featuring Hero Arts this week and the theme is Ombre. Ok, I know I said no more whining, but I just have to mention that all my Hero Arts Ombre pads are sitting in my craft room in Canada……………just saying. Anyway, I managed to make up an ombre background with my Hero Arts inks that I had left here in Phoenix. I rediscovered a Hero Arts wooden stamp that I must have bought at a garage sale and a card was created. I made an ombre image with the stamp as well by using three shades of Hero Arts grey ink. This card is not a showstopper but hopefully is a catalyst to getting my mojo back. Hello, I am back after a very long absence and a very long drive down to El Mirage, Arizona. I haven’t gotten my scraproom organized or the scrap stuff I brought down from Canada unpacked yet, but I wanted to get a post up before someone sent out the RCMP to look for me. I saw this layout I did last year of my Great Nephew and thought it would be a cute one to post. He reminded me so much of the baby in the movie The Hangover, I just wanted to capture the moment in a scrapbook page.